Great for any craft project that comes to mind, these Foam Craft Hands can be glued, taped, stapled, painted and more! 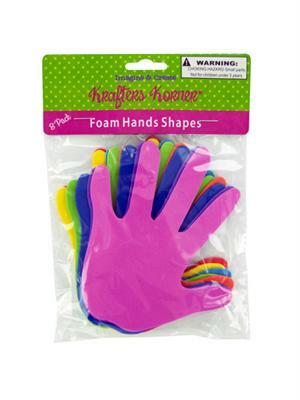 Each pack comes with 8 hands in pink, purple, blue, orange, green, yellow and red. Each hand measures approximately 4.5" x 5". For ages 3 and up. Comes packaged in a poly bag with a header card.